"More than 18 million people in the U.S. are currently at risk of developing health problems from lead leaching from pipes in their water distribution systems," says Gabriel Lobo, a doctoral student who is presenting the work at the meeting. Lead poisoning in young children can cause a broad range of symptoms, including brain damage, learning difficulties, and slowed growth and development. Adult exposure can cause high blood pressure, memory difficulties, miscarriages and other conditions. Historically, many municipalities installed iron water mains that were connected to individual buildings by lead water pipes. In a typical lead pipe, chemicals in the water cause the inside wall of the pipe to corrode, releasing lead ions into the water, Lobo explains. To address this problem, municipalities add corrosion inhibitors to the water. 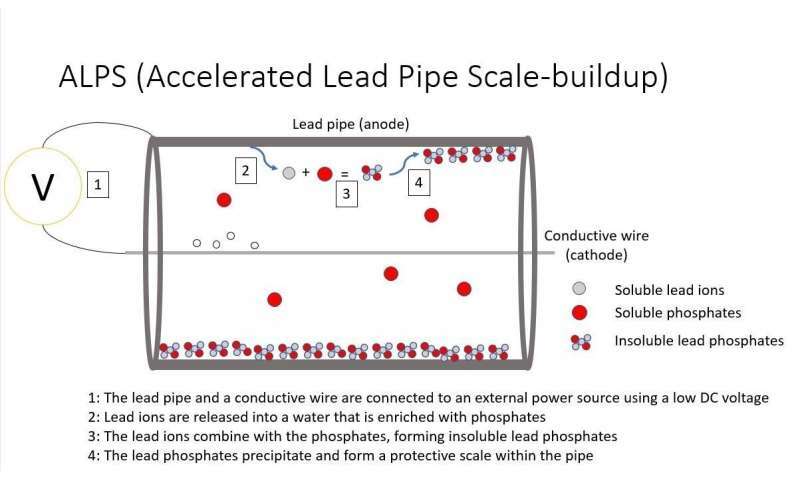 Over time, these added phosphates react with the lead ions to create compounds that deposit on the inside of the pipe. This coating, or "scale," blocks other lead ions from leaching from the pipe into the water, making the pipe safe for water distribution. However, in Flint, the drinking water source was changed to a source that had different water quality, and concurrently, the city of Flint stopped using corrosion control measures. The protective scale dissolved, and toxic lead ions leached into the water. Lobo became involved in this issue when his adviser, Ashok Gadgil, Ph.D., began to focus on finding a solution for the lead problems in Flint. Gadgil's team is at the University of California, Berkeley, and Gadgil is also affiliated with Lawrence Berkeley National Laboratory. The researchers have tested their process in the laboratory but caution that they haven't yet conducted any trials on lead pipes in the ground. For real-world applications, Gadgil envisions attaching external connectors to a homeowner's pipe at the water meter and at other junctions in the pipes, and then threading another wire through the pipes to complete the circuit. "The idea is that we wouldn't have to dig the whole pipe out, so we could keep the cost low," Gadgil explains. "Replacing all the plumbing in one house would cost several thousand dollars, whereas our process would cost less than one tenth of that." Currently, the group is working with experts from a local water utility in California to determine the practical parameters for a test under real-world conditions. They are also planning to conduct a test later this year at an Oakland school where normal scale buildup isn't happening in the pipes. More information: In situ electrochemical passivation of lead pipes in water distribution systems, the American Chemical Society (ACS) Spring 2019 National Meeting & Exposition.